After notching my first in round 6, I was hoping I had turned the corner, but in round 7, I was knocked back down by GM Jaan Ehlvest (2591 FIDE). Ehlvest and I have played a number of interesting games – this was the 5th game between us, and the 4th where he had the white pieces. The first two times around, I outplayed him in different lines of the French Defense, and since then, he has not tried 1.e4 against me. The first few opening moves were the same as in my game against Altounian from round 4 (1.Nf3 d5 2.g3 c6 3.Bg2), and I decided to go with the …Bg4 setup instead of the …Bf5 setup I used in that previous game. I wasn’t expecting the King’s Indian Attack (Jaan can play just about anything), and I had not really reviewed the opening phase of that game in between, so I figured he had found what both Altounian and I suspected was there (a small advantage for white). Unfortunately, what I tried in this game also didn’t quite equalize. 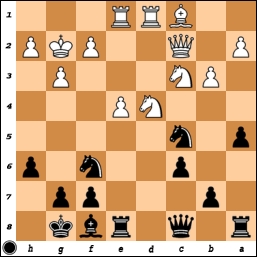 White has played the KIA with c4, cxd5, and then Qc2 and e4. With a little more space and central control, White has a definite plus. It’s nothing amazing, but Jaan likes to work with small positional advantages like this and it was definitely not what I was hoping to get from the opening. In the two games where I had the most success against him, I had quickly created dynamic imbalances and then outplayed him in complications later on. Here, I’d have to sit and defend for a while – not something I’m unfamiliar with, just not something that I’d like to do. White has just played 19.b2-b3. 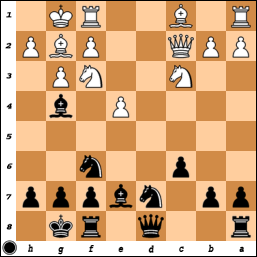 I thought I had done well to get here from the first diagram above, as the bishop exchange has relieved some congestion and the flank pawn moves (…h6 and …a5) have covered my knights against some annoying threats. Still, White has the more space and a more harmonious position. Black’s main question is how to finish his development and I didn’t answer this properly. 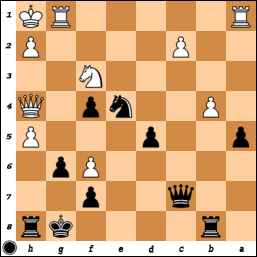 I played 19…Qc7, and after 20.Nf5 Rad8 21.Bf4, I went back to c8 with the queen. Jaan didn’t increase the pressure accurately, and that is why I equalized later on. In between the Week 8 and 9 USCL matches, I went to Reno for the Western States Open. I would need a very long post to go through the games one-by-one, so I’ll stay relatively high level for the discussion here. Maybe I’ll look at them in more detail later. I finished with 4.0/6, beating 4 much lower rated players, while losing to GM Jaan Ehlvest and IM Bryan Smith. I thought I played pretty well in some of my wins, notably against NMs Dana MacKenzie and Gregg Small – I had lost twice previously to Dana (albeit in games some time back) and had failed to beat Small’s QGA opening at the North American Open in 2005. Actually, that opening will be linked to that tournament for me for some time as I had only recently begun playing 1.d4 then. I hadn’t done any preparation for the QGA, but then 3 people played it against me that tournament! All of them made draws as well, although I had some chances in a couple games. Since then, nobody has dared to repeat the opening! Anyways, it was good to finally beat the QGA, and also to win a pair of Exchange Frenches after I failed to beat a lower rated player in that opening in Miami. The loss to Ehlvest was an unfortunate one, but I can take some solace in the fact I defended a worse position for 7 hours. Actually, the game took about 6 hours and 55 minutes, but who’s counting? The final 3 hours of the game can be replayed in the USCF’s article about the event, available here. The real disaster came in the evening round, against IM Bryan Smith. I played a brilliant piece sacrifice (if I may say so myself) in the opening and reached what I considered to be an absolutely dominating position. However, the 7-hour morning round seemed to take its toll on me, and I simply couldn’t calculate any variations at the board. The same line would just replay through my head over and over again. In the end, I got into horrible time pressure and blew the win and lost the game. GM Sergey Kudrin took clear first with 5.0/6. GM Ehlvest headed a group of 3 players who finished on 4.5/6. I came in tied for 5th with 6 other players, including Smith. I think this was my first time playing the Western States in Reno, and I would say the tournament is well-run in some aspects and rather poorly run in others. The organizers do a good thing by providing a quiet playing hall, boards and pieces for everyone (and often clocks for a number of players), having demonstration boards so people can follow the top 10 boards from afar, and putting together a games bulletin at the end of the event. However, the pairing system (both in philosophy and application) falls short of the mark in my view. Also, unlike the bigger events in Las Vegas, the playing hall is not on the casino floor, so there’s much less smoke around. In Vegas, I feel like you always leave the event smelling like smoke. On the bad side, for starters I’m pretty sure they still do pairings by hand at this event. This means that virtually every round starts late, up to 30-40 minutes late in fact. Secondly, Chief TD Jerry Weikel is unique in his pairing process – when there is a score group with an odd number of players, he drops the middle rated player to play the highest rated player of the next score group. This is the only tournament in the world where I’ve seen this system, as normal USCF rules mean you drop the lowest rated player of the odd group to play the highest rated player of the next. Color alternation is also thrown out the window in his tournaments, so it’s not only common to get a 4/2 color split in a 6-round event, it’s quite possible to get 3 colors in a row! Maybe part of the reason I’m annoyed by this is that after losing a long game to Ehlvest, I came back after a short break to see I was playing a strong player in Smith (and then lost that one too), when the people around me got much easier pairings. But logically and by the letter of the rulebook, I don’t see why he does it this way, and after the event, GM Alexander Ivanov concurred, explaining that he’d been trying to convince Jerry for years that this pairing system does a dis-service to everyone involved.